1 Warbret's gunmetal colored wings held him aloft, high above the ground. Wisps of mist dampened his scales as he brushed the edges of clouds. His eyes were fixed on a mass of people working their way up the long road toward the farm of Montrose and Mara. From this height, it should have been impossible to discern their intent, but, somehow, he knew they were hostile. 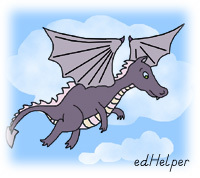 2 The young dragon folded his wings and dove toward the ground. He landed behind a row of trees and walked toward the house and barn. 3 Mara heard him land. Why had he returned so soon? She put down the basket of eggs she had gathered and rushed to find him. 4 "What's the matter, Warbret?" she asked anxiously. She reached out to touch his face. When her fingers contacted the ridge above his eye, she saw the sight he had seen. 5 "This doesn't look good, does it, Warbret?" she commented. "Stay out of sight. I'm going to warn Montrose." 6 Warbret warbled questioningly in his throat, and Mara took a moment to stroke his neck. 7 "I'm sure it's nothing for you to worry about," she said. "Just stay out of sight." 8 Mara hustled around the barn and scooped up the basket of eggs as she rushed to Montrose's workshop. 9 "Montrose!" shouted Mara. She struggled to keep her voice calm. "There is a crowd of people headed this way."